These Youtube.com clips, courtesy of Chris Zizzo, show the Chesapeake and Ohio "Chessie" 614 in Port Jervis and heading back toward Hoboken, NJ. Great train chugging and whistle sounds! 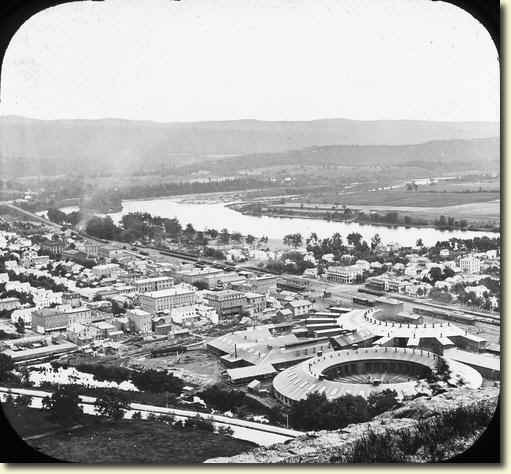 The following group of photographs from the Library of Congress show the roundhouse which had at its center the railroad turntable. Click on photos for larger size images. 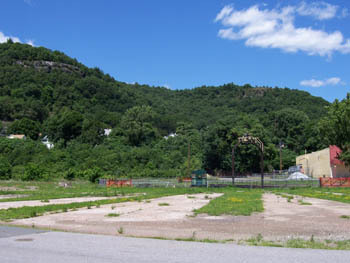 Erie Railway: Port Jervis Roundhouse. The next four photographs were taken in 2005. The roundhouse which encompassed the turntable succumbed to an arsonist's fire in the 1980s. Looking southeast, this picture shows the bed of the turntable on which engines and cars were sent to individual track spurs for repair or had their direction reversed. 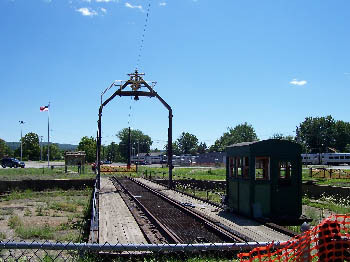 The structure is the turntable's control booth. 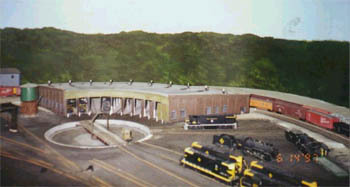 This photo conveys the roundhouse layout and shows the spoke-like rail spurs which were utilized as repair bays. The turntable control booth is at far right center. Shot in a more northeastern direction, this angle of the repair bay rail spurs includes the "Point Peter" scenic viewing area at right center below the clouds. A reverse view from Point Peter shows the roundhouse's repair bay spokes at bottom right. 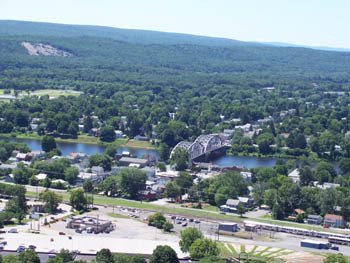 Across the Delaware River bridge lies Matamoras, PA. The mountains are in NJ. Featured on an interesting 1920 Aero map of Port Jervis found on the Library of Congress web site is this detail drawing which further illustrates the roundhouse layout. 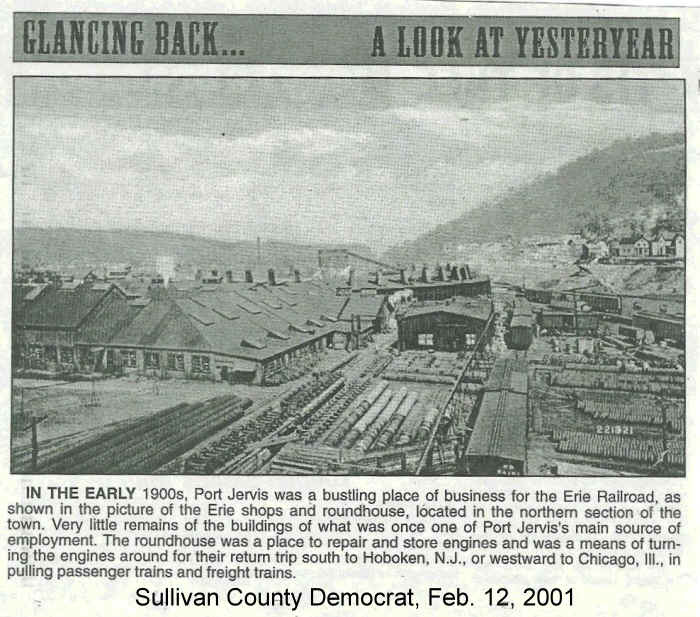 Harold Werthwein's "fabulous Erie Railroad-Delaware Division" includes a model section of the Port Jervis roundhouse and turntable. 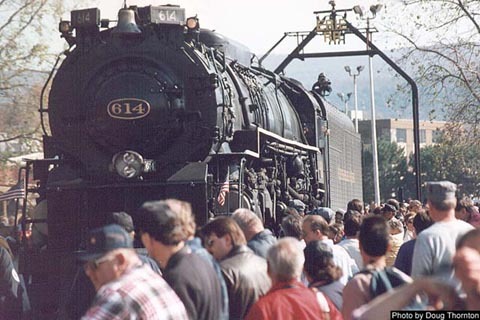 The Chesapeake and Ohio "Chessie" 614 was photographed by Doug Thornton on the Port Jervis turntable during one of the train's several visits in the late 1990s. Unfortunately, enthusiasm for maintaining the turntable ebbed after Chessie had problems with performance and federal railroad regulations. 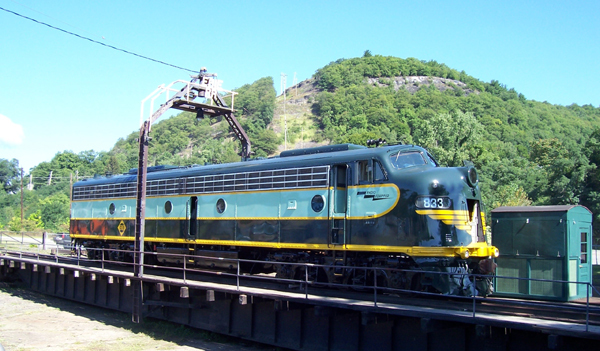 Today (2016) the 614 is housed at the C&O Railway Heritage Center in Clifton Forge, Virginia. Although this reprint does not adequately show the roundhouse (rear center) it does give a sense of the busy Erie rail yards in the early 1900s. 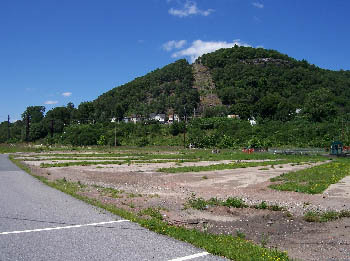 Note that the houses in front of the mountain at right also seem to still be seen in the 2005 picture shown at the top of this column.